We have 3 litters of piglets! Young female pigs are called gilts. Once they give birth to a litter, they are known as sows. Gestation length (time they are pregnant) is 114 days, easily remembered as 3 months, 3 weeks, 3 days. We synchronized these 3 so they would all farrow together. Then I induced them all the same day. The first to begin labor was Birch, who had her first litter this past fall. This is litter number 2 for her. 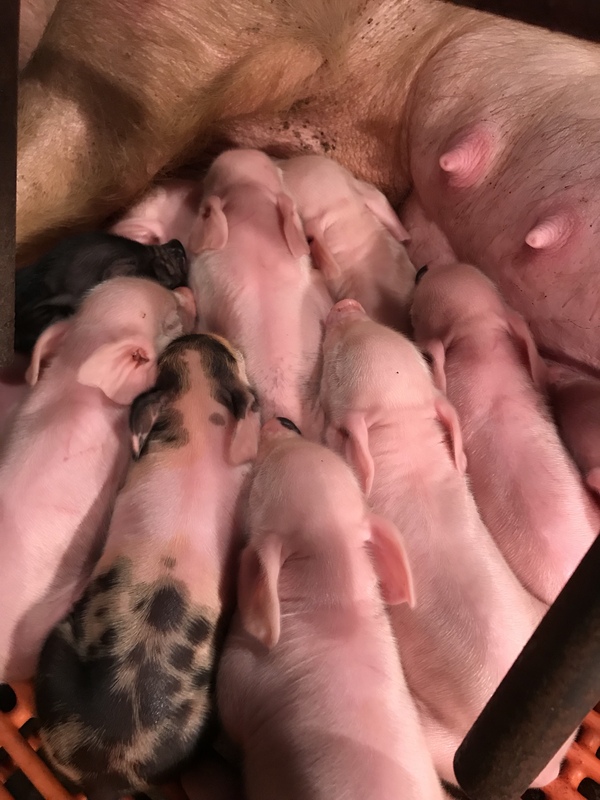 This is just before a piglet is born. You can see the amniotic fluid dripping out as the uterus contracts, and she pushes that piglet through the birth canal. This video shows a piglet immediately after birth. Note the umbilical cord still attached. The piglet will be up and trying to nurse before the umbilical cord finally breaks at a natural point. In this clip, Birch stands up and the umbilical cord snaps. This first piglet was up and nursing in 13 minutes. She delivered 11 total piglets in just under 2 hours. I have a neat video of one piglet still attached with the umbilical cord when she delivered another piglet. Sometimes they get in a hurry. After farrowing is complete, I will tie off those long umbilical cords and dip them in iodine. The umbilical cord is a potential site for bacteria to enter the body of the newborn piglets. It must be clean and dry. I will write a separate post with that process. Here is one final picture.